Christy Nishita, PhD, Age-Friendly Honolulu; Terry Muldoon, KP Hawaii; Georgette Deemer, City & County of Honolulu; and Frank Streed, Age-Friendly Honolulu. Kaiser Permanente has awarded $82,700 in community benefit grants to Age-Friendly Cities (via fiscal agent Adult Friends for Youth) and YMCA Maui for their programs promoting healthy lifestyles and community engagement. 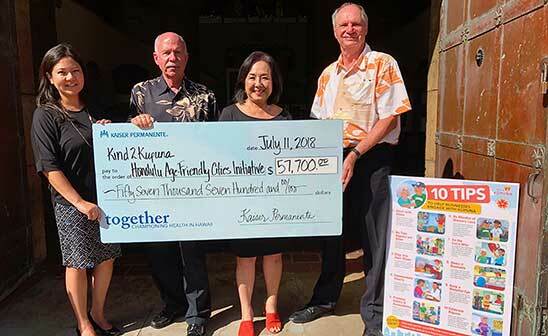 Age-Friendly Cities received $57,700 for its Kind2Kupuna program, an initiative to develop age-friendly businesses that provide tools and resources to support the needs of “kupuna,” or elders, in the community. The program will work with 10 pilot businesses in a variety of sectors to adopt age-friendly initiatives that support the physical and cognitive changes associated with aging. The grant will also fund a public awareness campaign to increase engagement between businesses and kupuna. YMCA Maui received $25,000 to implement the YMCA Diabetes Prevention Program, an evidence-based health intervention program approved by the Centers for Disease Control and Prevention to prevent the onset of type 2 diabetes. The program encourages behavioral and lifestyle changes to help patients maintain healthy, active lifestyles. The year-long program will be completed by three cohorts of at least 15 participants on Maui with the goal of reducing individual body weight by 5.5 percent.